So - you know some Python, HTML and CSS, and you've ventured into Django for the first time. You've put together your first Django project, and you are now in a position to deploy it. Unfortunately, however, this can't be done at the click of a button (initially at least!). I think that the deployment of your first Django project is harder than putting together the project itself. The deployment is a skill in itself, and you should approach it in exactly the same way as you approach learning to code - start with a very, very simple example, and build up your knowledge through lots of practice. Eventually, the deployment will become second nature. There are several popular platforms out there for deploying Django apps. The top 3 are probably AWS, Google App Engine and Heroku. This article will talk you through the deployment of the most basic Django app (without any CSS or static files eg images) to Heroku, using a Windows environment. Of course, I am 99.9% confident that your Django app contains CSS files - however, it is best that you start with the simplest Django deployment possible and then progress from there. you need to have Git installed, and a basic working knowledge of Git. a Heroku account - you can sign up here. (to be clear, you do not need to pay to deploy a basic Django app to Heroku, you will not have to pay for anything at any point in this tutorial!). Heroku Toolbelt. This can be downloaded here. This allows you to connect to your Heroku account via Windows Powershell. The majority of problems encountered when deploying your first Django app to Heroku will be caused by problems with git, pip or virtualenv. If you do encounter problems in the steps that follow, it is thoroughly recommended to go back and practice working with git, pip and virtualenv until you really understand them, and are confident in using them. 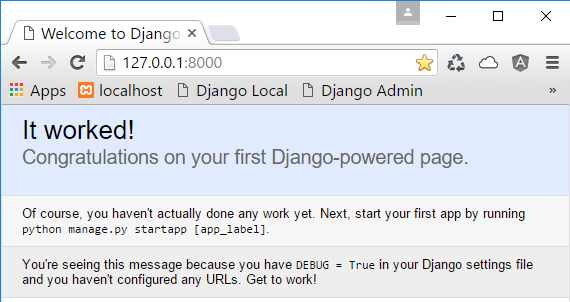 Running the app locally will now display the default Django app. You have now verified that your basic Django app is running locally, and are ready to deploy to Heroku. (venv) should now appear at the beginning of your path in Powershell. You can deactivate the virtual environment in Powershell at any time by running deactivate. However, if you encounter error messages while installing these packages then you might have to install each one individually (again, with pip). For example, when I first started using Heroku I had problems installing psycopg2 with pip. I therefore installed each of the required Python packages using pip, but used easy_install to install psycopg2. Heroku recognises the packages used in your Django app by looking inside the requirements.txt file. You create your requirements file using pip and virtualenv. Running pip freeze requirements will display the packages that you have installed in your virtual environment. To save these requirements to your requirements.txt file, run pip freeze > requirements.txt. Key Step: in Windows, your requirements.txt file will be in Unicode format by default. What the official Heroku documentation doesn't mention is that the requirements.txt file must be saved in ANSI format for the Django app to be deployed to successfully. 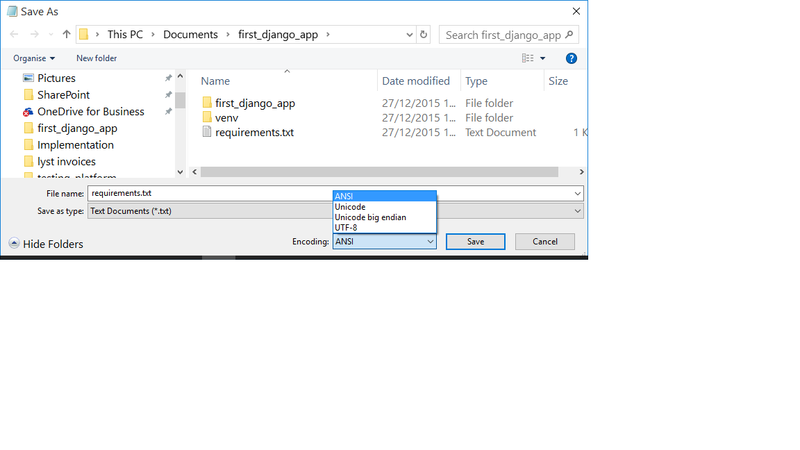 Open your requirements.txt file in an editor (eg Notepad), click 'Save As' and change the encoding to ANSI. Documents/first_django_app> git commit -m "first commit with app ready for deployment"
Writing objects: 100% (16/16), 4.95 KiB | 0 bytes/s, done. Of course, your app will not be deploying to sleepy-island-7305 like mine - it will be using another app name. 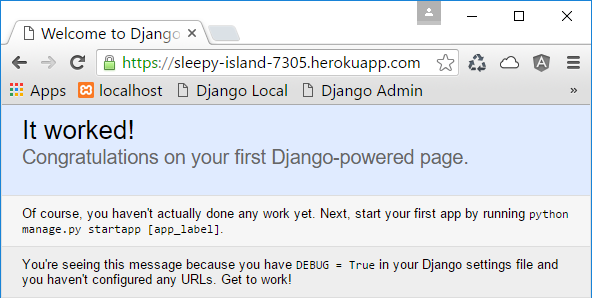 You can now visit your app at the designated URL shown in Powershell (mine is https://sleepy-island-7305.herokuapp.com/). If you are having problems with any of the above steps, then go back and read, re-read and re-read this article. Make sure you are following each step exactly as I show you - you have to be precise. If you are new to any of git, pip or virtualenv then go away and practice them until you understand them more comprehensively and are confident when using them. This will make the process of deploying Django apps to Heroku quicker and easier. The code for this project (minus the virtual environment) is available at https://github.com/lambo477/first_django_app.